1791: "Telescopes: Refractor vs Reflector"
Title-text: On the other hand, the refractor's limited light-gathering means it's unable to make out shadow people or the dark god Chernabog. Last edited by gmalivuk on Mon Apr 03, 2017 3:06 pm UTC, edited 2 times in total. Methinks you guys didn't "get it". Vampires do not reflect in mirrors. If there was one out there, this would in fact be true. JGeezer wrote: Methinks you guys didn't "get it". Nope, if it's a decent refactor it's a prism. Showsni wrote: Are you positing that vampires can still be totally internally reflected? That's the lore in at least some stories, yes. Anyway, the depicted refractor does seem to have a mirror, not a prism. Vampires can't be seen in a mirror. But to spot a space Vampire, it must be flying, and therefore be in bat-shape. Now, can you see a vampire in bat-shape in a mirror? Might there be a difference between space vampires and Earth bound vampires that is being missed? Something related to the Refractor's limitations Re: shadow people and Chernabog? JGeezer wrote: Nope, if it's a decent refactor it's a prism. Isn't a prism set up like that actually reflecting, since the refraction is past the critical angle? I wonder if vampires don't reflect in mirrors because the reflective part is a silver backing. If so, then I suppose a reflective prism would still allow their image to appear. So if we do spot a space vampire, we send up Bruce Willis and ....? richP wrote: So if we do spot a space vampire, we send up Bruce Willis and ....? ...he comes back with a bunch of prismatic stones. You're better off sending Wesley Snipes. Even if he doesn't succeed, at least you've solved half a problem. richP wrote: Bruce Willis and ....? I know this is tounge-in-cheek, but he is missing a couple drawbacks of reflectors, like coma, astigmatism, difficulty of figuring, central obstruction, and field curvature. I know those can be fixed, but with a Newtonian, you need pricy optics to do it. 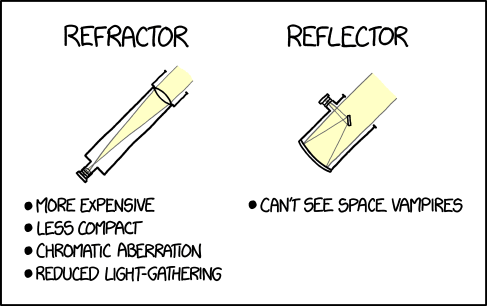 EDIT: I'm very much a reflector guy though. That raises a whole load of questions. Can they be photographed? Chemical photography uses silver compounds, so perhaps not. What about digital photographs? Do they appear in selfies? The self-view picture in a Skype or FaceTime call or a video conference? Perhaps they're visible at the remote end but not locally? In that case, you'd expect vampire selfies to be badly framed. There's something to look out for on your Facebook friends' pages. The right angle piece at the viewing end of a refractor is called a diagonal. The eyepiece fits into the diagnonal. Astronomical refractors (as opposed to spotting scope used for terrestrial viewing) use a front surface mirror in the diagonal - not a prism. You can make a refractor as big as you want to collect as much light as you want. It'll just get very expensive, very heavy, and very crappy image quality. And one last jab at vampires: the canon is that they're impure and so the purity of silver won't hold their reflection. But unless they automagically transfer impurity to their clothes, how come we can't see their outfits? Upon reflection, I think we need to refactor the reflector. cellocgw wrote: And one last jab at vampires: the canon is that they're impure and so the purity of silver won't hold their reflection. But unless they automagically transfer impurity to their clothes, how come we can't see their outfits? That aspect of vampire lore has always bothered me. I know the whole concept of vampires requires suspension of belief, but I've always felt the more a vampire story decided to explore that aspect, the more holes it would pick in it until the whole thing became clearly logically impossible - I mean, impossible to even be consistent with itself. I mean, so the silver can't reflect light that came from a vampire, how does it know what colour light to replace it with? Can the silver see through vampires? so there you have it. Made a mistake, good 2 kno. Perhaps they do not appear in mirrors, and consequently not in photographs because you aren't actually seeing them at all. They are not visible in the sense of actually reflecting incident light but are only visible as manifestations in your mind. If you are not looking directly at where they are they do not manifest. orthogon wrote: That raises a whole load of questions. Can they be photographed? Chemical photography uses silver compounds, so perhaps not. That's been the update of lore, certainly. Silver is mystical (or anti-mystical, see also lycanthropic aversion/vulnerability to the stuff) such that it 'ignores' a vampire (and typically their attire, though that might be an acclimatisation to their basic aura, with recently grasped items remaining visibly unsupported in a reflection of the scene - according to some Law Of Drama/Comedy/Whatever) and does not do anything with that subset of light. And somehow gets to 'see' and reflect/process the light that the vampiric form was obscuring. If there's silver (or silver-analogue - but outside of the Cu/Ag/Au stack, because those other two are sometimes specifically capable of reflections, implicitly or through SFX oversight) in a CCTV camera system, it might be equally capable of 'ignoring a vampire'. Alternate theorem: Vampires are invisible but emanate a 'glamour' of their image, which works to trick everyone with direct vkew of them in seeing their own projected form (possibly allowances for seeing the shadow of their form, too, although in this case maybe the truer, less-cutured, more-leathery-winged version) instead of the background light. Silver(-like) 'devices' for doing more with light than showing a shadow are impervious to the necessary overlay of the mystical image, so just don't show what the direct Mk 1 Eyeball would. JPatten wrote: Perhaps they do not appear in mirrors, and consequently not in photographs because you aren't actually seeing them at all. They are not visible in the sense of actually reflecting incident light but are only visible as manifestations in your mind. If you are not looking directly at where they are they do not manifest. That was a possibility that occurred to me, that light passes straight through them and the only way we can see vampires is that they implant their image in our minds. Which would mean they could turn completely invisible if they wanted to, so it's weird they don't make more use of that. Did you know that a vampire wearing mirrored lenses can see out the back of his head? If you ever find yourself asking, "is the answer to the question, "is the answer to the question, "am I the only one?" no?" no?" The answer is still no, but you should probably close all those Logic Puzzles tabs and go to sleep. What if it is not a conscious thing. I mean after all, can you radically change your skin pigment by thinking about it? Perhaps it is just their Nature. They can no more will themselves invisible than you can will your skin to be paisley or plaid. Looks like it's been fixed so there's no reflector in the refractor anymore. Mutex wrote: That was a possibility that occurred to me, that light passes straight through them and the only way we can see vampires is that they implant their image in our minds. Which would mean they could turn completely invisible if they wanted to, so it's weird they don't make more use of that. Unless the "implanting an image" trait was obtained during vampire evolution and they can't actually control it. Well, other than turning their image into that of a bat. Maybe, but you have to admit, it's getting slightly convoluted. Mutex wrote: Maybe, but you have to admit, it's getting slightly convoluted. But I should be careful, that statement can set off a Whole other set of internet arguments. How many electrons will be sacrificed to that discussion? It also introduces a problem with another part of the lore. If light passes through them, why does sunlight kill them? Let me introduce you to my friends Chameleon and Cuttlefish. Not nearly as convoluted as quantum mechanics and that's not even fiction. Sunlight is so bright that they overload their "image overlay" system! In other news, the comic has indeed changed to reflect Randall's intention. But we will continue this subject, Kalium_Puceon. New headcan(n)on: What if vampires are just metaphors for US? What if you can't see their reflection because we are blind to ourselves and each other through an impartial medium? Nah. It's just makes for a cool and spooky story. Whizbang wrote: Might there be a difference between space vampires and Earth bound vampires that is being missed? Something related to the Refractor's limitations Re: shadow people and Chernabog? Clearly, space vampires have reflections, but their reflections don't. That assumes the vampire is doing it voluntarily. It might be that humans are psychic and can just sense vampires. Or, it might be that the glamour is a side effect of the vampire's willful insistence that they still exist; if the vampire stopped insisting, they'd stop being visible, but they'd also stop being. [vampires] can no more will themselves invisible than you can will your skin to be paisley or plaid. I won't deny they can...but vampires are..or were human. Not cuttlefish.. I was going to point out in recent versions of the lore, it's specifically UV light that kills them, but I guess that could mean only visible light passes through them, not UV which kills them. Yes, but only guaranteed to work with very old digital cameras. New digital cameras, including cell phones, are highly likely to be built with RoHS compliant solder, which is likely to contain silver. This raises the question of how vampires react with the rest of the EM spectrum. Do they show up on radar? What happens if you put a vampire in a microwave?